Let's rewind 200+ years ago. What we all know as the Oktoberfest started with a Royal Wedding on October 12, 1810 when King Ludwig I (then he was the Crown Prince Ludwig) married Princess Therese of Saxony-Hildburghausen. All the citizens of Munich were invited to attend their wedding celebration (talk about a massive reception) which was held on the fields in front of Munich's city gates. The locals had such a fun time at the celebration, they wanted to continue the tradition year after year...thus, the annual Oktoberfest was born! These fields were renamed Theresienwiese ("Theresa's Fields") to honor the Princess, and the metro stop that takes you to the Oktoberfest is still called that today. You'll hear locals shorten the Theresienwiese, to the Wiesn (pronounced vee-zin) which is colloquial for Oktoberfest. 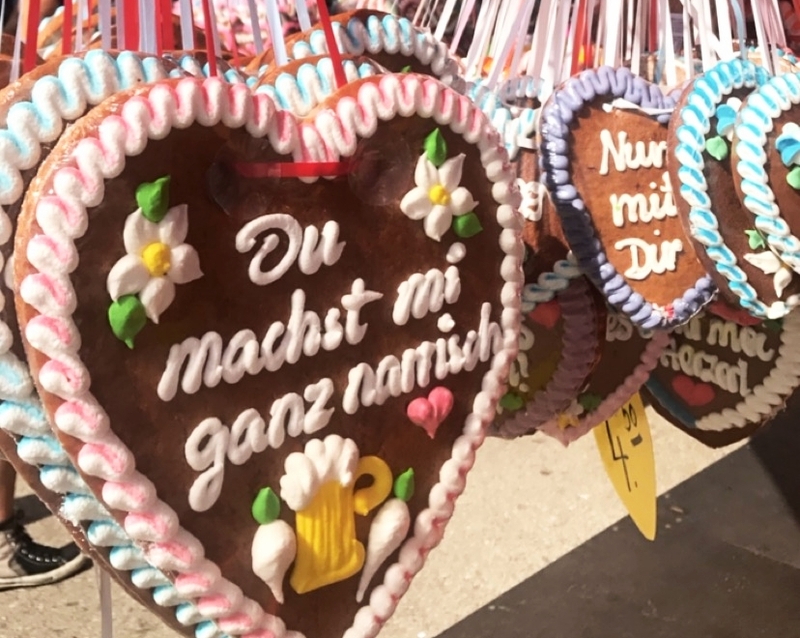 Over the years, as the Oktoberfest grew in popularity, the organizers moved the dates of the festival up by a couple weeks, since the weather in September is warmer and more cooperative than it is in October. So now, every year you can count on the Oktoberfest kicking off in mid-September and running through the first weekend of October. 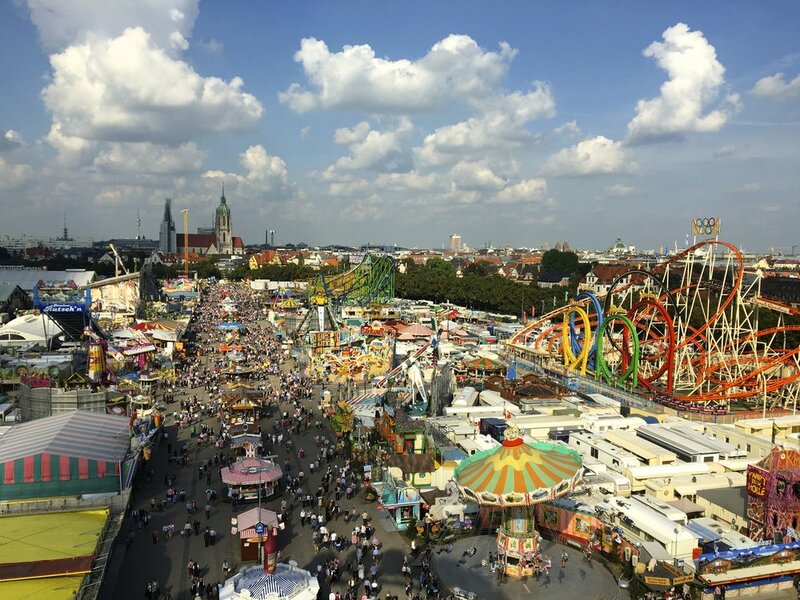 Today, the Oktoberfest in Munich is the largest festival in the world, drawing nearly 7 million people to Munich's iconic Wiesn. A whopping 6 million liters of beer are consumed over the 17-18 day celebration! Bavarian's take their beer seriously, and only beer adhering to the Reinheitsgebot can be served at Munich's Oktoberfest. Reinheitsgebot is the "German Beer Purity Law", and requires that the beer must be brewed within the city limits of Munich, and that only water, barley, and hops can be used in it's production. There are six beers from famous Munich breweries that conform to the purity law and they make up the different beer tents at the festival. They are: Augustiner-Bräu, Hacker-Pschorr Bräu, Löwenbräu, Paulaner, Spatenbräu, Hofbräu-München. At Oktoberfest, visitors keep the Bavarian traditions alive by dressing in traditional lederhosen and dirndls and dancing to festive Bavarian music played by Oompah bands in each tent. The bands are a critical part of the Oktoberfest's festive spirit, but the bands don't just play traditional music. Once 5:00pm hits most bands switch their lineup to 80, 90's and classic tunes we all know and love. All in all, Oktoberfest is one of the best parties we've ever been to, and we know you'll agree! The Oktoberfest is a very international festival and it's even more enjoyable when you get to know new people! Share tables with strangers, talk to the locals, and dance with the people next to you. Also, be extra nice to your waitress. The waitresses control the beer tents, so if they don't like you they'll have no problem ignoring you, giving you slow service, or even kicking you out. You'll be walking, dancing and your feet a lot at the Oktoberfest, so it's important to wear comfortable, closed toed shoes that you don't mind getting some beer spilled on! Tachtn means traditional garments in Bavarian. They are dirndls for the ladies and lederhosen for the men, but we've seen guys wear dirndls and women wear lederhosen, so whatever strikes your fancy when you're getting in the festive spirit! Our day at the Oktoberfest starts around noon and many people don't leave till close to midnight, so that's a longggg day of dancing, drinking beer, and mingling. It's important to pace yourself and know your limits! A good trick is to order Radler, a mix of Sprite and beer, so you aren't just drinking beer the whole time. Also, remember to drink H2O throughout the day! Every year, we have a reservation at the Löwenbräu tent, but it's important to see more than just the tent and to experience all that the Oktoberfest has to offer! Ride some carnival rides, try the pastries and chocolate covered fruits, play the games, and visit the other beer tents. You'll walk away from your Oktoberfest experience having a better understanding of the full festival. You won't want to end your day early because you didn't fill your belly enough. Eat a hearty breakfast, order some pretzels and wursts at the Oktoberfest, and keep your tummy happy and full throughout the day so you'll have the stamina to enjoy the festival till the end! Dancing on the benches is OK and encouraged, but one step on the table can get you kicked out of the festival, so don't even think about it! Oktoberfest does not take credit cards, so leave your plastic at home. The tents and all vendors at the fest are cash or voucher only. There are some ATMs available on the premise, but they don't always work, so come with cash. We recommend bringing100-150 euro. Munich is the capital of Bavaria and is one of the world's most acclaimed cities for beer enthusiasts, but did you know it's also a surfer hot spot?! 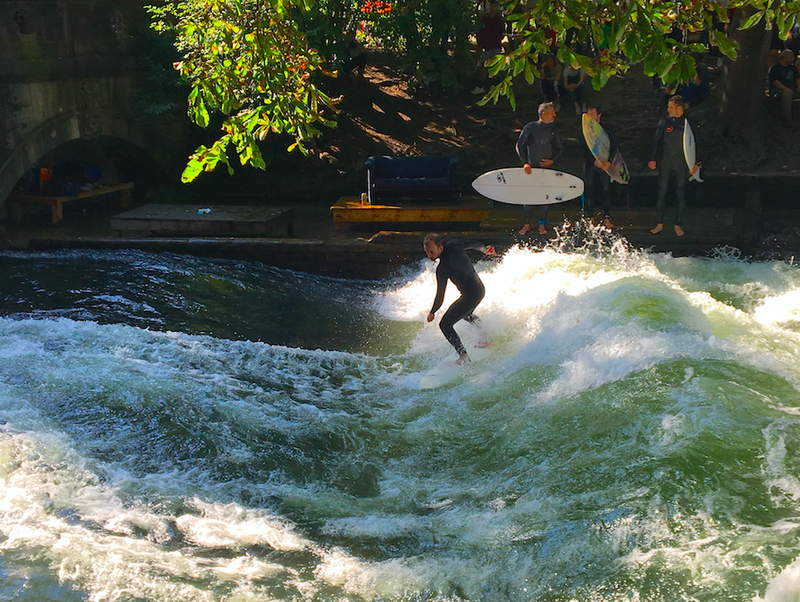 The Eisbach is a small channel of the Isar River that runs through Munich’s Englischer Garten, and more than a hundred river surfers attempt the icy cold wave on DAILY basis. Snow is no deterrent either, as surfers are out on the wave in all 4 seasons. Don't try this if you are inexperienced though! The wave is fast and powerful and you'll need to surf from the second you hit the water, because there's no paddle time. Garmisch-Partenkirchen is home to the highest point in Germany, the Zugspitze. This area of the Alps is famous for it's paragliding, and rightfully so! On a clear day, when the winds are right, you can see the mountain's peak, and picturesque green farmland below. Bonus fact: Garmisch and Partenkirchen used to be separate villages, but Adolf Hitler forced the mayors to combine the villages into one as a part of the Winter Olympic Games that were held there in 1936. The famous ski jump from those Olympics still stands tin the town, and is used in ski competitions to this day. 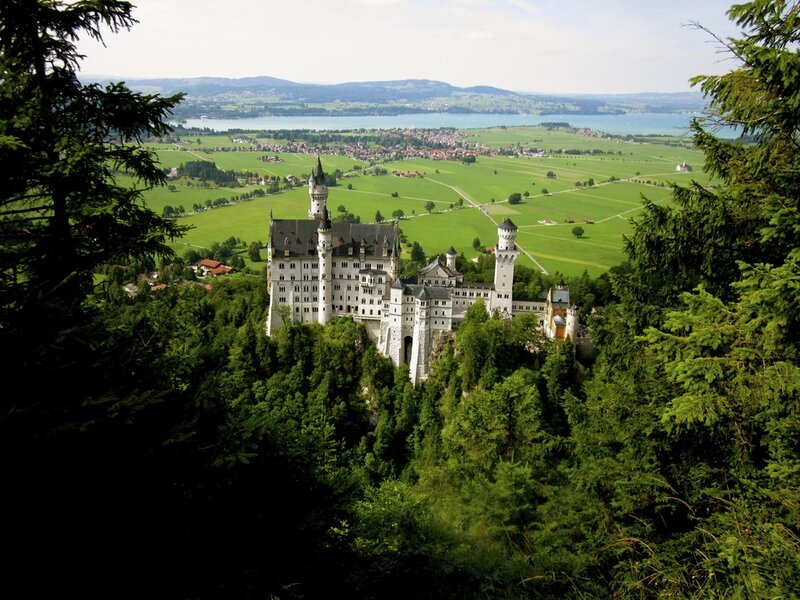 The mountain town of Füssen is home to the famous Neuschwanstein Castle. Does it look familiar? Maybe that's because Walt Disney was so inspired by Neuschwanstein's fairytale design and architecture, he used it to create the Cinderella castle in the cartoon film in the 50's, which led to the inspiration for the Disney logo, as well as the Cinderella Castle at Disneyworld and Disneylands around the world! When many people think of Germany, they think of men in lederhosen, women in dirndls, big steins of beer, large pretzels, and bratwurst. All of this is true, but not for the majority of Germany! This stereotype comes from Bavaria, which is rich with tradition, Catholic roots, and is a lot more like Austria than it is the rest of Germany. Even the Bavarian language is closer to Austrian than it is to the Hoch Deutsch (High German) most Germans speak. Bavarians are proud to be Bavarian, and they often will introduce themselves as Bavarian first and German second. This pride is also apparent in their cities and towns, where the blue and white Bavarian flag is flown more prominently than the German flag. Biking is one of the easiest ways to get around Munich and other Bavarian towns, and you'll find special bike paths for those traveling on two wheels everywhere. It's said that every Bavarian family is in possession of at least one bike! In Munich, watch out for the bike paths as they look just like pedestrian sidewalks, but they aren't, and the cyclists WILL run you over. Here's a day by day breakdown of what you'll need for each stop on our adventure. 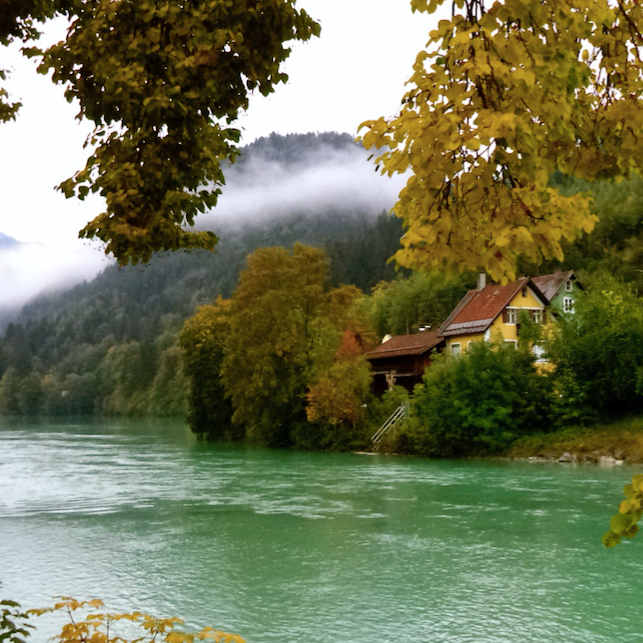 Remember to pack a light rain jacket, as rain is always a possibility in Bavaria this time of year! Bring the usual things: PJs, camera, toiletries, etc… and also pack a light rain jacket and/or umbrella just in case there are some showers (which can happen this time of year). All the hotel rooms have blow dryers, but bring your curling iron or straighteners if you use them, along with a converter. Last but not least, pack light! We’re moving around a lot and you don’t want to be lugging a huge suitcase (not to mention we need to be able to fit everyone’s things in our Euro bus)! You shouldn’t need more than 2-3 pairs of shoes. Trainers for hiking/biking, booties or sneakers for the city/evenings, and a comfy pair of closed toed shoes/sneakers to go with your trachten that you will want to dance all day in and don’t mind getting beer spilled on at the Oktoberfest (for most these are the same pair as your city shoes)! Late September tends to be mild in Germany, however be prepared for all types of weather. Evenings are definitely chilly (mid 50s), but during the day it can get up to mid 70s, so bring a sweater to be prepared for all kinds of weather. Rain is also common, so remember to pack a rain jacket! Germany uses Euros and you can easily take them out at an ATM at the airport, at a bank in the towns we visit, or at any Bureau de Change. You can use credit card at some places in Germany, but cash is definitely preferred. Please note, paragliding and the Oktoberfest are both cash only. Click here a full list of what is included on this adventure. + I'm going to need to charge my phone and camera, so what's the plug situation? The plugs in Germany are the standard European outlets 220-240 Volts and they are two round prongs that look like this. You can easily get an electrical adaptor online or at an electronics store, and they sell them in the airport in case you forget! + What should I expect on this adventure? 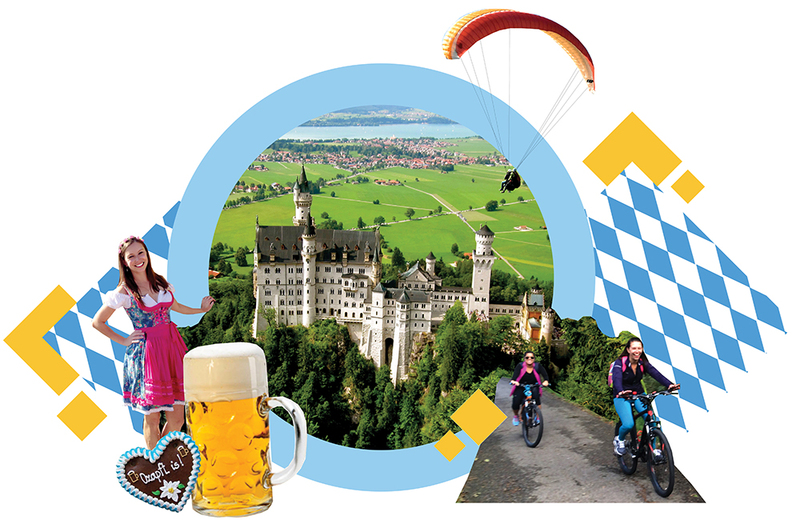 Our WHOA Bavaria and Oktoberfest Adventure is low on the difficulty scale but high on adventure and fun (pun intended)! If you’re in decent shape you’ll do just fine with all the activities we have planned. We recommend doing a few hikes and bike rides beforehand to get used to vertical trekking and comfortable on a bike (in case you haven’t ridden one in a while)! It also won’t hurt to practice your “Prosts!” if you know what we mean. That said, we want you to be responsible and know your limits. The beer served at the Oktoberfest is stronger than most beer you're used to and it is served by the liter. Don’t drink too fast, and don’t drink too much! Yes! For all WHOA adventures we require that you have travel insurance. We recommend World Nomads as it has great adventure coverage, and it’s easy to get! All you have to do is CLICK HERE to get started. + What airport should I fly into, and by what time? You should fly into Munich Airport (MUC) by 12noon on the adventure start date. Our team will be at the airport to greet you on arrival! On the departure day, you're free to leave at whatever time suits your scehdule. Since everyone's flights are at different times, you can easily arrange a taxi, uber, or take the S-bahn to the airport from our hotel. The hotel reception can help you with this! + Will there be solo travelers on this adventure? Yes! Many of WHOA's adventurers come alone looking for a fun group of likeminded ladies to adventure with. We'll pair you with another solo traveler to room with throughout the adventure. You'll quickly see we all become fast friends and leave the adventure feeling like family!